↑ Rizzardo, RA; Milfont, MO; Silva, EM; Freitas, BM (December 2012). 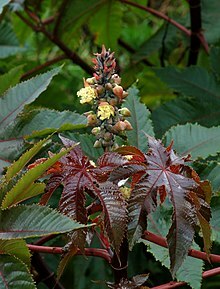 "Apis mellifera pollination improves agronomic productivity of anemophilous castor bean (Ricinus communis)". Anais da Academia Brasileira de Ciencias. 84 (4): 1137–45. doi:10.1590/s0001-37652012005000057. PMID 22990600. ↑ Mutlu, H; Meier, MAR (January 2010). "Castor oil as a renewable resource for the chemical industry". European Journal of Lipid Science and Technology. 112 (1): 10–30. doi:10.1002/ejlt.200900138. หน้านี้แก้ไขล่าสุดเมื่อวันที่ 2 ธันวาคม 2559 เวลา 06:12 น.